I’d been looking forwards to this trip ever since I booked it. OK, that was only February, once negotiations with Senior Management had concluded successfully, but still, 6-7 weeks of really looking forward to it. Ami decided she’d like to come too, for a bit of an adventure, and apart from extra food it doesn’t really cost any more, as I was planning to go in the car and the hotel rooms always sleep at least two. The plan was to attend the seventh annual Brugse Beer Mega Event. On the face of it that sounds like a bit of a drinking trip that’s not really suitable for child, but one has to remember that the alcoholic beverage that Belgium is famous for is “bier” or “biere”, depending on your choice of language. “Beer” in Flemish is an animal. It’s the animal that is best known for defecating in the forests, and it also happens to be a symbol of the City of Bruges, despite the fact that the city crest has a lion on it. Anyway, that’s all tomorrow’s activities. Why ? Because there’s no point in going on a caching trip to Bruges for one day when you can go for four days. This was the first. The day began almost as soon as the previous one had finished, with us getting out of bed at 2:15am to set off at 3am trying to make a trip through the Channel Tunnel at 7am. 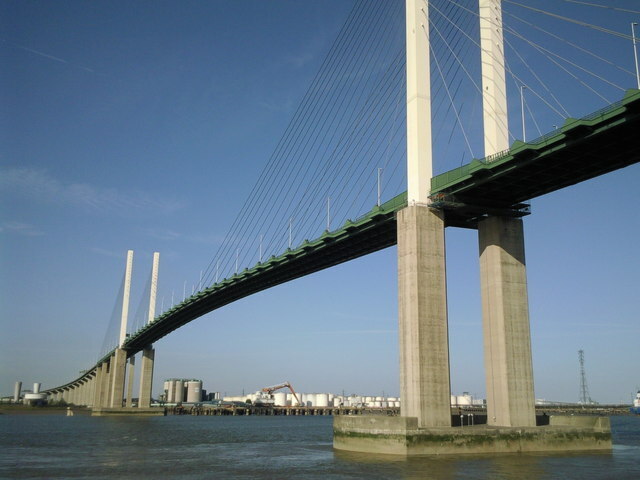 So because of the chosen route, here’s the customary photo of the QEII Bridge. I always add this one to my blog posts for European driving holidays. This day when we crossed it was rather dark. We arrived at the terminal early, having completely failed to find any form of traffic jam, and the very nice machine offered us the opportunity of an earlier train – two trains earlier in fact. The car park was very quiet and there were no queues inside as we dived in for a quick breakfast and some coffee. We were killing time in the terminal until we were supposedly 5 minutes from being called, at which point we called ourselves and drove through to passport control. It was quiet. The French border control guys don’t bother much with who goes into their country on the train at this time of morning. We went through so early, in fact, that we managed to bump ourselves forwards another train. We eventually caught a train at 6.20am UK time, about an hour before the one I booked, and we’d already had breakfast too. At the other end we got out of the terminal quickly despite having a quick stop to turn our bikes round and we were soon on our way east towards the Belgian border. We didn’t quite get all the way there though, because we planned to start the caching by doing the “Franco-Belge” series which, as the name suggests, is in both France and Belgium. The French part is in the commune of Ghyvelde, so that’s where we parked. We went to the marked parking for the series but I didn’t fancy it, as it was just a grassy patch by the roadside. Instead I trolled along a bit further to the ninth cache in the series, which is right by the border and has some proper parking spaces next to it. So the first cache we found was in France. The second was in Belgium. The third was in France again and then the fourth was into Belgium. We then stayed in Belgium for about 25 caches as we approached the village of Adinkerke, which is apparently famous as a hotbed of cheap tobacco selling, and then walked away from it again back to the French border. The place where we crossed the border here has a bit of a memorial celebrating the sacrifices of various world wars and the bond of friendship between the neighbouring districts of Ghyvelde and De Panne. As we crossed back into France here the footing changed for the first time from paved surface to loose cobbles and sandy soil. At least it was dry though and it was still quick walking. It was sufficiently quick, in fact, that we were at the far end in no time and looking for the series bonus cache. It proved to be easy. We didn’t have all the right numbers, as we were yet to do numbers 1-8 of the series, however the missing number only had two possible values, and one of those was suspiciously close to the listed parking spot. That was the one. After this it was then a matter of slogging our way back through #1-#8 before raiding the back of the car for some of the pastries and cold drinks we’d carried over with us. At the end of this walk we’d found about 50 caches and it had taken just over 4 hours, so that was a pretty good conversion rate and a good start to the weekend. The weather was cool but sunny, and by the time we got back to the car we needed those drinks. Once we were in the car I realised my error on the earthcache we’d been trying to get to all morning, and realised we just needed to go back to the place with the little monument and the two flags, and walk about 500m into France, to get the needed information. Easy peasy, lemon squeezy, aside from the fact that I managed to drop my foot into a massive dog turd on the way back, which resulted in me having to spend a good 15 minutes trying to winkle the stuff out of the sole of my boot using a sharp knife and some toilet roll. That’s 15 minutes of my life I’ll never get back. So why did I call this post “Jeux Sans Frontieres” ? Well, we cached in two different countries in an area where the presence of an international border is rather academic, to say the least, and also because Peter Gabriel’s excellent song of the name contains the line “whistling tunes, we hide in the dunes by the seaside”, which is kind of what we spent the morning doing. It’s all joined up thinking round here you know. None of your random rubbish! Meanwhile, back at the plot, all of that turd winkling meant that I sort of wanted to go wash my hands, and it was about time for a short break anyway, so we jumped on the motorway and stopped at the services at Mannekensvere. We stopped here on our way out to our family holiday to Holland in 2014 too (see On Our Way). On that day we got irritated with the procedure of having to pay for fuel first, then filling up, then getting a refund of anything you didn’t spend afterwards. This time no such problems, because I didn’t need a fill up, so we just spent a few cents on using the toilets and had our first ice cream of the trip (holiday rules apply). While we were eating our ice creams outside on their patio we decided we’d done with walking for the day, so we went to grab a few drive-by caches from a series at Waardamme. We ended up chasing round a German bloke, who was doing them on his bike. The series was designed for bikers, so he had the upper hand on us as we had to keep finding places to put a car. We got through about a dozen of those before deciding we’d had enough, at which point we headed of in the general direction of Bruges to check into our hotel. The hotel was kind of basic, but it was much as I expected and we were only going to use it for sleeping anyway. They do breakfast too, so I paid up front for six of those. It was still fairly early in the evening and we still had some “stuff” to do. Specifically there was a caching event at a hotel 500m away from ours, which proved to be a very popular event, and we did a handful of caches there before going to the evening “official” event, which was down in Loppem. Neither of us was in the mood for a lot of socialising at a big event, because we were tired and hungry, so we signed the log and mooched about for all of 10 minutes before giving up and going back to the hotel. From this point onwards the evening went a bit Pete Tong, as we found that we were in a massive gap between any buses passing our hotel. We started walking and I searched for restaurants on my phone, but the first one we found was fully booked. So we kept walking in the general direction of Bruges old town. It was further than we could have done with, but when we eventually had done with walking and looking for restaurants we ended up in the Brouwerij De Halve Maan – the home of the rather nice tasting Brugse Zot and Straffe Hendrik beers. I should know. I tried three of the four they brew. The weakest was 7% alcohol. The strongest was a rather chewy 11%. I had that one instead of a pudding. When we arrived we were Hank Marvin so with the first drinks I ordered some bread and cheese, traditional beer snacks around here, and got a fairly substantial hunk of old (and hence very tasty) cheese. While we were working our way through that Ami ordered a spaghetti bolognaise and I ordered a “Vlaamse stoofkarbonaden bereid met Brugse Zot dubbel en verse frietjes”, which roughly translated is a dark beef stew made with strong brown beer and served with chips. It was very, very nice. The gravy was thick enough to be eaten by scraping it up with the chips. And the chips were big enough to allow the scraping up of the gravy. By this time I was somewhat the worse for drink. Well, not worse, just more relaxed really, but enough that Ami and I had a good old chat about nothing in particular whilst attempting to find our way out of Bruges old town in the dark. We arrived at the station just in time to realise we were at least 90 minutes late for the last of the daytime buses, and forty minutes before the next scheduled night bus that was going our way. For some reason Ami seemed reluctant to opt for a taxi, but eventually she gave in and we grabbed a quick ride home. All in all it had been a very long day, even though it was only about 10pm. We’d been up for about 21 hours and we’d driven 220 miles, walked about 8 miles, and found 70 caches. That’s what I call a decent start to a weekend of caching. La geocache du singe ! BB7 – Meet ‘n Greet, eat and sleep.